This article has been updated with a new introduction and additional entries by Robert Ham. 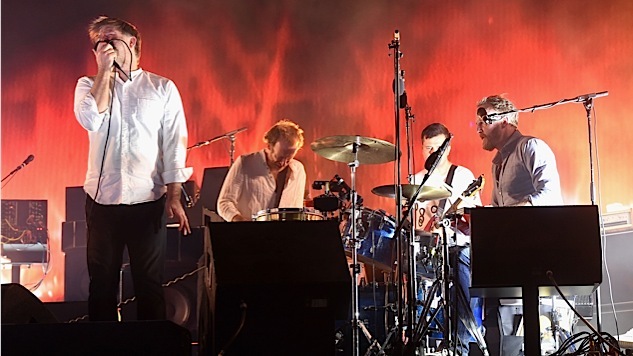 After dubbing their then-final statement, the live recording of their farewell show at Madison Square Garden, The Long Goodbye, LCD Soundsystem went about the long return. They started playing shows, teased new music and for an interminable while promised a full-length was forthcoming. They fulfilled that and then some with the September release of Amercian Dream, an album that evidenced a maturation in leader James Murphy’s already finely tuned spin on dance music and his lyrical outlook as he spent much of the album worrying over personal relationships and his mortality. James Murphy has said in interviews that “Somebody’s Calling Me” is essentially him stealing from Iggy Pop’s “Nightclubbing,” but written on Xanax. While that works for the majority of the song, the insane synth sounds thrown in the chorus are more jarring than interesting. While many times on This Is Happening, LCD Soundsystem plays around with the experience for the listener (see “Dance Yrself Clean”), “Somebody’s Calling me” is almost too abrasive. “Hippie Priest Bum-Out” was released as an extra on several, much better LCD Soundsystem releases, from 45:33 to the B-side on the U.K. single release for “North American Scum.” That’s exactly what “Hippie Priest Bum-Out” feels like, an interlude, in-between material, a break in the middle of the fun that surrounds it. “Hippie Priest Bum-Out” isn’t bad as a bonus track, but that’s what it feels like, lacking much substance of any of the heart that fills most LCD songs. Despite being the debut film score of James Murphy, the soundtrack for Noah Baumbach’s Greenberg surprisingly only features one LCD Soundsystem song, “Oh You (Christmas Blues. )” The track sounds nothing like other material from the band, much more bluesy and similar to Pink Floyd, and especially different from This Is Happening, which would come out only two months later. But “Oh You (Christmas Blues)” does match the depression of that film’s main characters and Murphy’s solo work on the album is an incredibly fun diversion for the lead singer. In many places, LCD Soundsystem sounds like a combination of different directions the band could go in, which makes it a fascinating artifact of where this band never fully went. “Tired” is the loudest, most punk-inspired of LCD’s work. Originally a B-side to “Give It Up,” “Tired” shows an aggression in being exhausted, which most likely is where the origins of “Never As Tired As When I’m Waking Up” came from. But it’s a shame we rarely ever heard such anger and fury in LCD’s work ever again. What starts out as another groove-heavy entry into the LCD Soundsystem, buoyed by a perfect syncopated synth melody and simple, stutter-step drumming, turns into a drag of confused imagery once Murphy’s vocals kick in. Is it a message of hopefulness as it reminds the listener/protagonist over and over “You’re just a baby now,” or is it just an excuse to write about that morning’s hangover and prove that he knows the definition of the word “ablutions”? What keeps this song from sinking is a perfectly dead-eyed Nancy Whang vocal turn and a Robert Fripp-off guitar solo. “Yeah (Pretentious Version)” gets right down to what it is there in the title, longer than the already long “Crass Version,” without any lyrics and is nothing but a straight-up jam. The “Pretentious Version” is clearly LCD having a ton of fun, especially about halfway through as they go nuts on some drums and cowbells, but after the excellence of the “Crass Version,” the “Pretentious Version” does end up seeming like a bunch of fun screwing around. An instance where it feels like Murphy thought up what he thought was a hilarious song title, or gave an instrumental a goofy name, and stuck with it to the bitter end. The sad truth is that it, and the rest of the song’s unsettled lyrics, renders what would be a fantastic tune—a rumbling jam that evokes the sound of Joy Division’s future had Ian Curtis not taken his own life—into something tossed off and insignificant. It may cleanse the palate for the deeply felt closing song on American Dream, but it’s one of the most skippable songs on the album. In an interview James Murphy gave to The A.V. Club soon after the release of LCD’s final album, Murphy said “‘Thrills’ in a way, was totally about my life—and that was just dumb because my life was pretty dumb. Things happen in your life that change things.” In hindsight, “Thrills” is quite basic, as Murphy searches for, well, thrills in the dark of the club over fuzzy synths. For Murphy at the time, yes, “Thrills” was autobiographical in a way, but as it seems Murphy would agree, that time has gone and it doesn’t feel that way anymore, instead leaving a frantic dance cut without quite the introspective viewpoint he would later give with almost every song. Coming after “Losing My Edge”—LCD’s ode to feeling lost in the increasingly large world of music—“Beat Connection” has James Murphy trying to bring everyone together on the “saddest night out in the U.S.A.” through beat communication. “Beat Connection” is almost like LCD Soundsystem stating their first goals, to unite through the beats and songs, giving people an outlet to find love, have fun and come undone, assisting people find a literal beat connection. Even though in the song prior, where James is realizing he’s a creation of a bygone era, “Beat Connection” is him still being able to bring unification while their future is coming up from behind. While their debut album begins with a scream, Sound of Silver builds slowly into the melancholy of finding success and trying to find the normalcy within. As James struggles, Nancy Whang comes in almost like the song’s conscience stating, “You can normalize, don’t it make you feel alive? Get innocuous!” Sound of Silver was a step forward for LCD Soundsystem, combining entrancing beats with heartfelt, conflicted lyrics, both of which we get from the very beginning of their second album. LCD Soundsystem started with a song that presented the idea of being on the outside of the world you’ve spent so much time enveloping yourself in. “Pow Pow,” the last song that LCD Soundsystem recorded before their breakup, shows the advantages and disadvantages to the inside as well as the outside that they started out in. “Pow Pow” is almost a commentary to the last decade of music, as well as allows James Murphy to meander into in-jokes, references and stream-of-consciousness writing. “Pow Pow” is the exit interview LCD conducts before leaving the world they’ve excelled in for years. “Give It Up, was originally bundled with the B-side “Tired,” which makes sense since they’re the most obviously rock-inspired songs to come from their first album. “Give it Up” is a funky, rock song, reminiscent of Gang of Four’s Entertainment!, but sped up. With more pop-inspired songs like and “Daft Punk Is Playing At My House,” it’s amazing that LCD never found a more mainstream audience, especially considering how “Give It Up” is simply a wonderfully crafted pop song at its core. They wanted a hit? Well here it is.